NYC has plenty of BYOB restaurants, but finding one that lets you bring your own booze and serves delicious food? That’s a tougher order to fill. So we searched the city and rounded up ten of our absolute favorite spots where you can pop open a bottle of your favorite wine and settle in for a great meal. The atmosphere at this tiny storefront on Houston might be no-frills—it's a counter-service spot where hot pasta dishes and paninis are rushed out of the kitchen quickly—but the food is always delicious, especially when you're craving a glass of wine (with no corkage fee) and a comforting bowl of spinach and ricotta gnocchi. The pasta menu changes by the day, but on any given visit it might feature feature crab-filled ravioli in cream sauce or spicy tagliatelle pomodoro. This Upper East Side mainstay blurs the line between casual neighborhood sushi spot and high-end omakase bar. Unassuming from the outside, inside the ambience is relaxed and no-frills. But the $95 omakase menu—ten pieces of sushi, from miso-cured black sable to uni with quail eggs—is some of the best sushi around. Pick up a bottle of sake, take a seat at the bar and prepare yourself for one of the most enjoyable sushi experiences in NYC. Not only does this tiny trattoria feel like a piece of Italy on East Fourth Street, but it’s also one of our favorite places to go for a casual date night. It’s easy to feel at home here, especially since the whole restaurant is about the size of a studio apartment. Pick up something nice from Piedmont or Tuscany to go with the decadent black truffle ravioli. Better yet, make it two bottles—with a mere $5 corkage fee, why not? With its white tablecloths and lazy Susans on each table, this old-fashioned Chinatown institution may not be the trendiest spot in town. But the BYOB policy combined with the signature dish—crispy, juicy Peking duck, which is carved at your table and served in Chinese pancakes with crispy scallions and tangy plum sauce— make it ideal for big group dinners and Sunday-night Cantonese cravings alike. Lucali is one of the city’s greatest pizza institutions—on par with legends like Roberta’s, Di Fara and L&B Spumoni Gardens—meaning a meal at this cash-only spot is something of a New York rite of passage. Sure, the wait can be unpredictable, but with a bottle of wine (or two…or three) you won’t even realize you’ve been in line for two hours. After all, this simple yet perfectly executed thin-crust pizza is worth getting a little hangry for. From the outside, Wondee Siam looks like just another Thai restaurant in Hell’s Kitchen, one we’ve walked past dozens of times during our midtown commute without thinking twice. But once we tried the spicy chicken larb and whole fried snapper fillet, we were hooked. 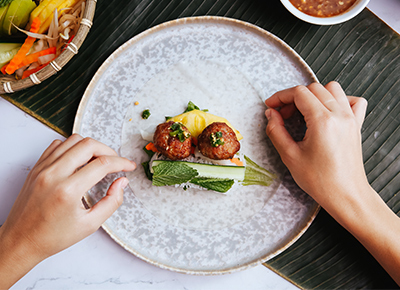 While you’ll find plenty of familiar noodle dishes and curries on the menu, this is a great place to try some less familiar Thai specialties you might never have tasted before. Just be aware that manyof the dishes pack some serious heat. P.S. : Don’t skip the mango with sticky rice for dessert. Some of the best soup dumplings in the city can be found at this walk-in-only restaurant on St. Marks. Wine and beer are on the menu, but for a small corkage fee you can bring your own bottle. We usually grab an off-dry Riesling or sparkling wine to stand up to the spicy Sichuan dishes you’ll find here, like the sizzling dan dan noodles topped with minced pork and chili oil and the fried chicken with Sichuan peppercorns. This Park Slope gem is the kind of restaurant where you want to become a regular. The vibe is warm and friendly, and surprisingly, you can almost always walk right in and find a table. For a $5 corkage fee you can bring your favorite bottle of Montepulciano to pair with the excellent pastas. We always have a hard time choosing between the airy pillows of pesto gnocchi and the creamy squid-ink fettuccine loaded with shrimp and lobster meat. If you live in the Carroll Gardens area, you’re likely familiar with this neighborhood spot, where you can pick up a bottle of Sancerre and eat comforting seafood in a space that feels like an antiques shop. Don’t miss the pleasantly greasy fried oysters and the seafood chowder, which is possibly the best in the city. Sure, it’s cash only and located on a less-than-spectacular block across from the BQE, but you can’t beat that $5 corkage fee. This picturesque French café almost always draws lines, especially on sunny days when crowds gather to take advantage of coveted West Village sidewalk seating. The real move is to come for brunch with a bottle of bubbly and make your own mimosas at your table to accompany the crispy corned beef hash and French toast topped with bacon.